Events in Devon during April herald the spring and summer season. Easter. the first holiday of the year. April showers and sunshine. It is a lovely month to be out and about. Powderham Castle is open again on 24th March 2019. Exeter Race Course Junior Jumpers Raceday 9th April 2019. Hartland Abbey Bluebell Day TBC Such a picture, the bluebells stretch from the Walled Garden to the sea!!! Beautiful for the soul. Exeter Racing Superhero Family Fun Day 16th April 2019. The 25th Maltings Beer Festival will take place at Osborne Park outside the Maltings Building in Newton Abbot on 11th to the April 13th 2019. Try out the West Country ales! Needless to say a very popular festival! Dawlish Walking Festival Date not set at time of writing. Watch their Facebook page. Newton Abbot Races Easter Saturday Season Opener 20th April 2019. 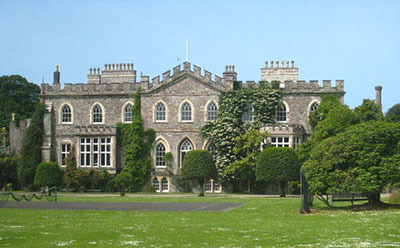 Powderham Castle has sat beside the River Exe for centuries and has been in the same family all that time! Apart from the Castle and grounds there is a lot to do. Doesn't really matter if it is a rainy day! Exeter is the county town of Devon and a great place to live and to visit. Plenty of good shops, trips down the River Exe, the racecourse nearby, the Quay side to name a few! Budleigh Salterton right on the Jurassic Coast at the western end. Lovely little place for a quiet, relaxing holiday. You can get on to the South West Coast Path for a stunning walk. 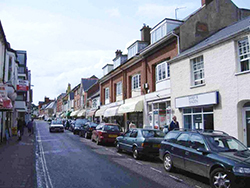 The Esturary is a Site of Scientific Interest and the locality of Budleigh Salterton is part of an Area of Outstanding Natural Beauty, which just about sums up this delightful area! Hartland Abbey Opens between the end of March and October. The house started life as a monastery and amazingly survived the Civil War because Henry VIII gave it away and it is still in the same family all these years later. The house, the walled garden and all the paths around make for a great day out. Bampton is on the edge of the Exmoor National Park. It is a pretty little town with lots of listed buildings. Has won the Britain in Bloom Event on several occasions and has also the distinction of winning the world one in 1999. Incredible. 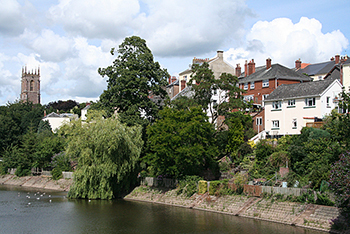 Tiverton is a most attractive town in mid Devon. On the edge of Exmoor it is an ideal spot for exploring this scenic moor. The castle is open to the public during the summer. The town has two rivers the main one is the Exe which rises in Exmoor and flows down to Exeter. Newton Abbot Tuckings Malthouse is open to the public and there are some good guided tours. The town itself igrew into q Victorian railway town from a little market town in the 1800's. The Racecourse, a summer jump course, makes for some good days out.